Putting yourself on the line African Folklore teaches us not to put our good reputation on the line for a shady friend. Aza received a prestigious invitation, to visit his old Friend Chief Basi in a faraway village to celebrate the birth of his first child. Aza is well treated because he is a friend of the Chief, and he is given one of the best rooms in the chief’s home to rest after his long journey. 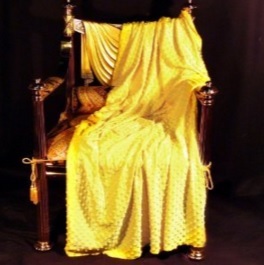 In his room, a hand woven Golden Blanket was stored. The blanket was to be presented to the chief during the feast at tomorrow’s festival celebrating the chiefs’ first-born son. Aza discovers the blanket and decides such a fine blanket should belong to his son. He takes the golden blanket, stuffs it in his travel bag and leaves the village, telling the people that urgent business requires him to go home and he is unable to attend the festival. On the riverbank nearby, Aza arranges with the ferryman, to be carried across the river; but before they embark, the people of the chiefs’ village run up, crying to the ferryman not to take Aza across, because he has stolen the chiefs golden blanket. Aza denies it, and declares that it is a lie to ruin his good name. Nevertheless, the people insist Aza is a thief. Aza yells, “If you don’t believe me, bring my good friend Chief Basi to search me for the blanket! Chief Basi is upset about his guest and dearest friend accused of being a thief and begins to reluctantly search him. To his surprise, he finds the stolen golden blanket on Aza but does not have the heart to disgrace his old friend. Chief Basi loudly declares to the people of his village that he has found no golden blanket. Take an African Safari in and around Africa discovering African sports, facts, art, folktales, proverbs and history.